I like this recipe as it can be used in any salad to spruce up the flavor, but it is also an excellent marinade sauce for both chicken and fish. Please don’t mix this recipe up with peppermint – this recipe involves the herb mint and pepper corns! 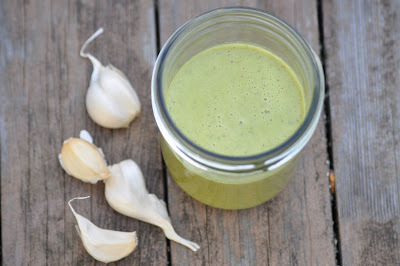 I will be using this sauce in tomorrows recipe in the 50 day nightshade free recipe challenge but I thought this recipe deserved a post of its own as I always find it hard to make decent homemade salad dressings. If you are following the Smart Psoriasis Diet Plan, then you are probably upping the intake of salad dishes into your weekly meal plan. Blend on high until very smooth, 1 to 2 minutes. Add the olive oil, blend on low speed until just incorporated. Pour into a glass jar and store in the refrigerator until ready to use. Bring to room temp before serving. Many thanks to nourishing meals for the above recipe.